A popular headline is that sitting is “the new smoking” with a growing number of office employees averaging over 8 hours per day sitting at their desk. There has also been a lot of scientific discussion of the of health risks posed by being sedentary (sitting) for long periods. Right now you might be thinking, “Well this doesn’t apply to me, I get plenty of exercise after work and I keep myself fit.” But is that enough? Research shows that exercising after work isn’t enough to prevent disease. Long periods of sitting is associated with diabetes, cardiovascular disease, and death - even for those who got exercise at other times of the day. Heavy sitters showed a 90% higher risk of developing diabetes than those who sat less, an 18% higher chance of dying of heart disease or cancer, and 24% greater odds of dying from any cause. These rates were the average among people who both exercised regularly and those who did not. It’s no wonder then, that sit-stand desks (or stand-up desks or sit-to-stand desks or height adjustable desks) are becoming increasingly popular. Is a Sit Stand Desks right for me? How do you adjust a Sit Stand Desk? Do I have the budget to update to Sit Stand Desks? Do all of my staff need a Sit Stand Desk? First off, let’s be clear, standing all day can be as harmful as sitting all day. The best option is to change postures throughout the day, moving often from sitting to standing and even perching at a stool height counter. The ideal candidate for a sit-stand desk is generally someone who is tied to a computer or phone at a desk and cannot easily get up and change postures by moving to another place within the office. Even small measures can make a difference - try taking waste bins away from desks so staff need to get up to put rubbish in the bin. Try to minimise drink bottles on the desk, so staff have to get up to get a drink. In addition, there are different options for rolling out sit-stand desks at the office. You could of course go all out (if you have the means) and give everyone a height adjustable desk, but often this is not practical. 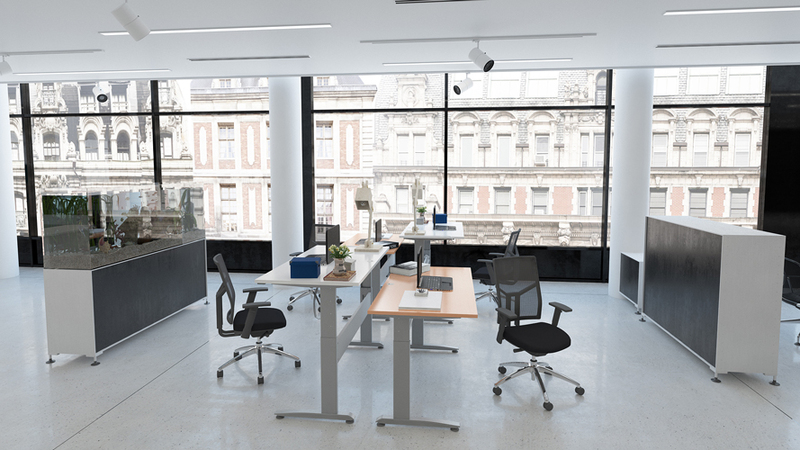 A very practical option is setting up shared sit-stand workstations throughout the office for people to use as needed. Lastly, some companies are saving the option to have a stand-up desk for people who have specific medical issues that require regular movement. Regardless, when choosing a Sit Stand Desk, it’s important to ensure that you consider all the options and thoughtfully evaluate how your people will use them. That way you can ensure they get used! Here are 10 things to consider when choosing a height adjustable desk. Height range. BIFMA (Business & Institutional Furniture Manufacturers Association) suggests an optimal height range being 575cm to 124cm but it will depend upon the height and needs of the individual using the desk. If people are sharing the sit-stand desk then best to find a desk with a large range. Depth. A 76cm depth is advisable as a minimum but this is taking into consideration that people will want to spread out their work. If that’s not an issue you can look at smaller footprints. In addition, bear in mind there are often multiple options for the shape of the work surface. Noise. Is the mechanism loud and disruptive or is it unobtrusive? When sit-stand desks are noisy they are often not utilized for fear of disturbing collegues. Ease of movement. There are numerous ways to raise and lower desks, from manual winding handles to electric or pneumatic lifts. The latter two being the most quiet, efficient and easy to use. Speed. How quickly does it raise/lower. Obviously, the quicker the speed, the more often people will adjust their worksurfaces throughout the day. Leg fatigue. One common complaint from people using sit-stand desks is that they get tired standing. Some strategies include; wearing supportive shoes, adding a riser to support one foot while standing, adding an anti-fatigue mat and encouraging people to slowly build up their tolerance by incrementally adding to the time they stand. High heal shoes are not recommended while using a Sit Stand Desk as they will increase leg fatigue. Programability. Some desks are easily programmed to different settings making them really easy to set the proper ergonomics every time. Functionality. Factoring in whether the aesthetic fit into your office environment as well as considering whether the desk can accommodate privacy screens, lighting or tool rails all will impact usability. Keep in mind that a desk at its' maximum height may require your equipment to have longer cables, so a power board or multiple socket power device may be necessary to have attached to the desk. And of course lastly you have to consider pricing which can vary dramatically within the stand up desk category. The best course of action is balance functionality using the above factors with your office roll out strategy. Office Furniture Deals supplies variety of options for today’s modern office taking into consideration different options balanced with price point. There’s never been a better time to consider a sit-stand desk for your office environment. There’s a lot of choice in the market right now and with the right evaluation criteria you can make an informed decision that will be right for your business and staff. Finally - be prepared to select different items for your team. Sit Stand Desks are not a`1 size fits all category. Be open minded and assess each staff member or site on it's merits. We are happy to discuss your specific needs to ensure you make the right choice.